Seen this cobra? Officials have been searching for the missing snake for days. 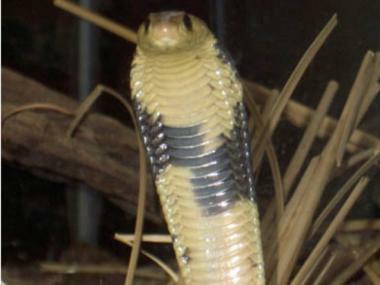 MANHATTAN — A venomous cobra on the lam from the Bronx Zoo is slaying people left and right — with its witty tweets. @BronxZoosCobra has the deadly Egyptian snake out seeing the sites in Manhattan. "Anyone know of a good vegan restaurant near Union Square?" the "snake" tweeted. The serpent also tweeted about hanging out at The High Line ("Loving the tall grass") Rockefeller Center ("OMG! Tina Fey totally just walked by me"), and the Metropolitan Museum of Art ("The Temple of Dendur really kicks some asp"). "After hearing about so much great stuff to do in NYC from the zoo guests, I just had to see for myself," the "snake" told DNAinfo. But will it go back to the zoo? "Who knows?" the elusive serpent said. "New Yorkers have seemed to really embrace me. I've gotten lots of offers from people saying I can crash on their couches. So maybe I'll just bum around a bit." By 4 p.m Tuesday, the Twitter feed had more than 60,000 followers. The real snake's been missing from the zoo's Reptile House since Friday. The Reptile House has been locked down since then as zoo workers have been trying to lure the deadly snake from its hiding place. The process could take "days or even weeks," the zoo said in a statement. "We understand interest in this story & that everyone wants us 2 find the missing snake," the Bronx Zoo tweeted. "Right now, it's the snake's game."